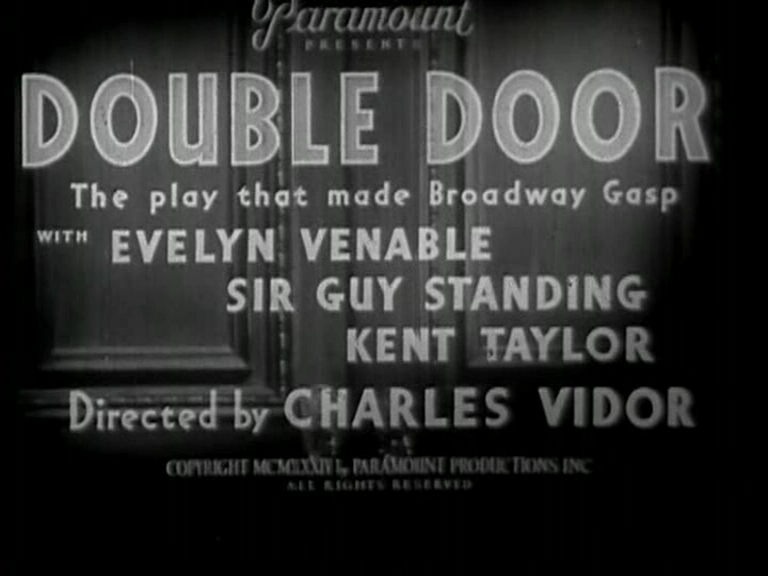 I can only assume that Charles Vidor’s DOUBLE DOOR hasn’t had much attention because the title is so off-puttingly banal. Might was well call it FRENCH WINDOWS or WAINSCOTING. Or ORNATE CORNICE. In fact, the movie is a somewhat stagey but very watchable thriller with some very pleasing direction by the Hungarian rhapsodist. Those of you who have exhausted the most celebrated 1930s horrors, moved onto the less-renowned ones, and are still hungry for more, should seek it out. Not quite a horror movie, it still hinges on the idea of premature entombment, and has a nasty villainess who sometimes provokes gasps of horror just by the way Vidor throws in a sudden close-up of her. 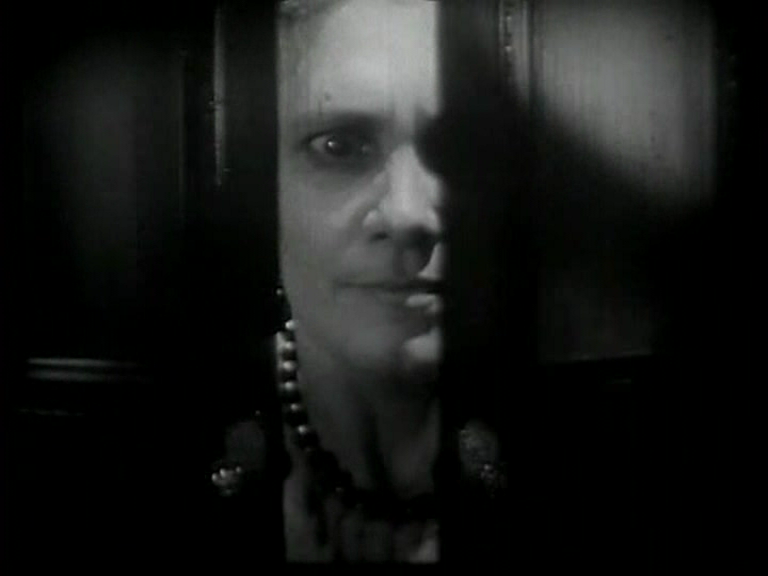 She’s played by Mary Morris, in what seems to be her only movie role. Very theatrical, with a scary old woman voice that’s obviously put on for the occasion — she was only 39! Her job is to be the audience’s hate-figure as she rules her family with an iron fist, deliberately trying to break up her half-brother’s marriage to Evelyn Venables (whose character name, Ann Darrow, appears to have been a popular one in the 30s). All to justify a chilling ending where comeuppance is visited with Old Testament viciousness. A great shame MM didn’t do more movies. I like flamboyant hambones, and anybody who can do a really hissable villain as unapologetically as this should’ve been in regular work. The title refers to the “mysterious sleeping room”, an airtight, soundproofed chamber designed to protect the house’s first owner from the noise of 5th Avenue traffic. Bizarrely, it has a combination lock which operates from the outside — I guess that’s a later addition. Due to the script’s rather rigid adherence to its source play, we never SEE the hidden room, but that does make the place seem all the more fearful. 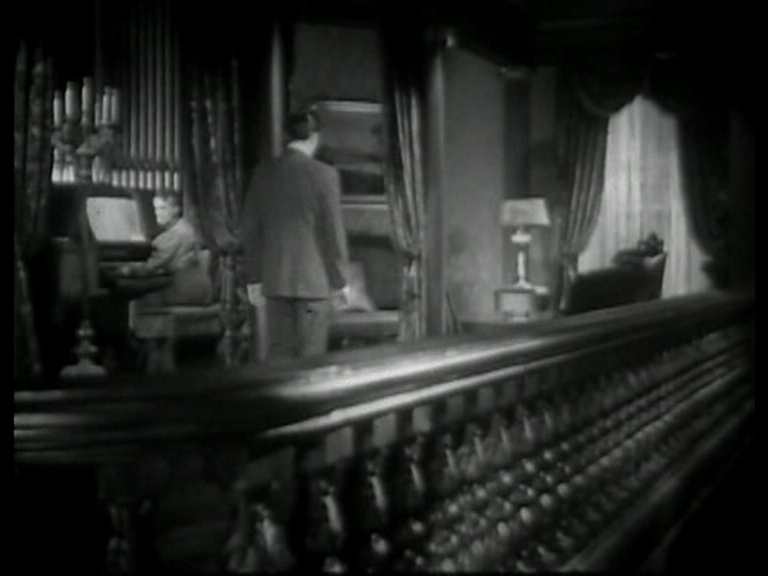 Vidor has great fun with the townhouse’s grand staircase, dividing the main set into two levels and getting a lot of compositional play out of the bannister. The hero’s memory of being forced to hold his dead father’s hand is presented via an atmospheric flashback, and Vidor generally does enough with the stagebound scenario to make one wish he’d been given a crack at DRACULA. Despite the brilliance of GILDA, I do feel he was a little smothered at Columbia. To cement her status as scheming mastermind, Mary plays the organ. Of course she does. To back up such a tendentious statement, I’d point to Vidor’s short THE BRIDGE, which has more visual and narrative genius in its ten minutes than… well, just about anything. This entry was posted on March 5, 2011 at 12:19 pm and is filed under FILM with tags Charles Vidor, Columbia, Double Door, Evelyn Venables, Mary Morris, The Bridge. You can follow any responses to this entry through the RSS 2.0 feed. You can leave a response, or trackback from your own site. I’ve seen this and it’s great cheezy fun. 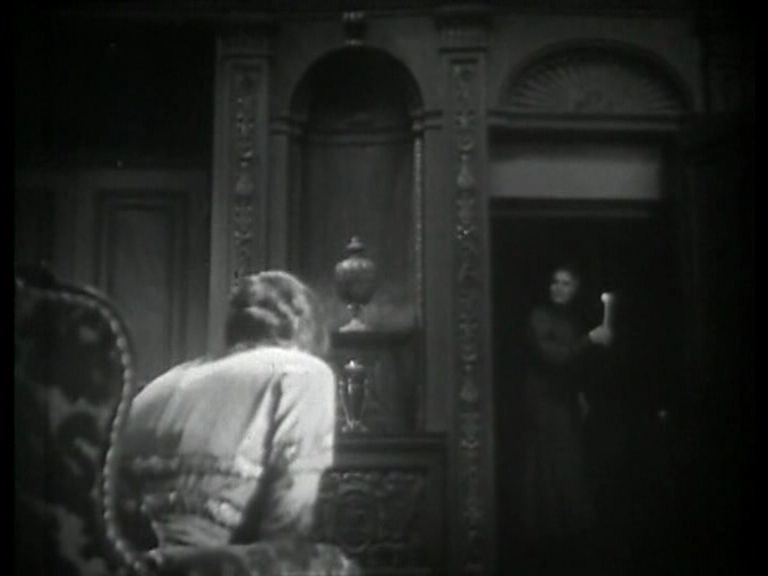 This was part of the early 30’s gothic style inherited from hoary old theatrical thrillers. Yes, and I was worried at the start that it’d be no better than Murder by the Clock or the other old dark house thrillers (barring The Old Dark House and a couple of other classics that transcend the form). It’s a bit smarter, a bit more subtle, and a lot more stylish than most. Venable, Standing and Taylor were also teamed in Mitchell Leisen’s sublime supernatural romance, DEATH TAKES A HOLIDAY (34). I guess I must’ve just been in the wrong mood when I tried to watch that one — I love Leisen, but I just couldn’t get on with it. A revisiting is called for. You’re telling me it is! Death Takes a Holiday is unspeakably beautiful. Frederic March’s work in the 30’s is very much in need of close attention. True, there’s a lot of unexamined work there, and I don’t even have a clear idea of his rise to fame. There’s a big gap in my viewing between The Wild Party and Dr Jekyll. Of course, she plays the organ. But does she play Bach’s Toccata and Fugue in D Minor, the de rigueur piece for insane movie villains? I really want to know. I don’t think she goes quite that far. But she doesn’t play “Get Happy” either, I can tell you that. I’ve seen a lot of March films from the interim period, and they’re generally good but uneven, for what I could see of them. All were poor dupes from VHS, generations removed. Most amusing was either Royal Family of Broadway or Strangers in Love, weirdest was The Marriage Playground, dreariest was likely Honor Among Lovers. Best may be Laughter, but there are a few I still haven’t seen. Does Merrily We Go To Hell count as interim? Am psyched to see that! Pretty sure it was after Jekyll. It was a more interesting romantic drama than Honor Among Lovers to me, though Arzner loved the name Jerry enough to give it to March’s character twice. Come to think of it, Strangers In Love was just after Jekyll, as well. He doesn’t get to do much in Paramount On Parade, the section he’s in is a showcase for Ruth Chatterton. I’m currently enjoying her in The Magnificent Lie, a somewhat contrived but still fun melo: she breathes real life into it. Hey, she does a French accent in that and sings, just as in the POP segment “My Marine”. Must watch TML now. Paramount must have had serious money troubles to let her and Kay Francis (who was starting to show real star quality) get away. Ah well, their loss was Warners’ gain. Can’t understand why she was thrown on the scrapheap so soon. She may have been sensitive about her age in Dodsworth, but she needn’t have been. As good as she is in that, possibly her casting implanted the idea that she was getting on in years. Plus playing such an affected character didn’t allow her to show how amazingly natural she was.